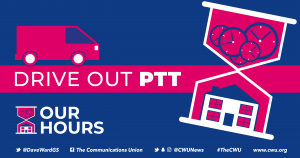 Welcome to the website for the Mid Wales, the Marches and North Staffs Branch of the Communication Workers Union (CWU). The Communication Workers Union is the biggest union for the communications industry in the UK with 203,500 members. Locally we represent members in telecomms, mobile, administrative and financial companies. The areas we cover include Aberystwyth, Landrindod Wells, Machynlleth, Newtown and Welshpool in Mid Wales; Ludlow, Market Drayton, Oswestry, Shrewsbury, Telford and Whitchurch in Shropshire; Hereford, Leominster, Ledbury and Ross-on-Wye in Herefordshire; and Crewe, Stafford, Newcastle and Stoke-on-Trent in the North Midlands. In addition to collective and individual representation we offer members a number of benefits and services details some of which can be found on the pages of the site. You can find a copy of the Branch Constitution on the Useful Links page.